Sports Stars International was founded by Peter J. Huthwaite while he was attending Eastern Michigan University. Since then, SSI over 600 athletes have signed with Sports Stars International worldwide. SSI has represented players in Football, Baseball, Basketball, Hockey, Swimming, Tennis, and securing many lucrative contracts including endorsement contracts. As well as individual players, SSI has branched out to represent Coaches, Entertainers and Political figures. SSI has been instrumental in consulting new Hockey Leagues and Football Leagues. Pete Huthwaite states "There's no amount of money available that will buy you experience except when you sign with SSI, you gain the value of all that experience." "Our commitment to the individual athlete is a promise of persistent hard work on their behalf. Whether you are on the cusp of entering the ranks of professional sports or are a veteran who realizes the importance of professional, you should contact us." 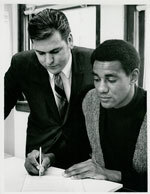 R. Haywood signs his contract with SSI as President Peter J. Huthwaite looks on. SSI has represented some of the finest professional athletes. More than 600 athletes have signed with SSI to represent them. At SSI, Pete and his dedicated staff specialized in negotiating individual contracts. He and his staff knew how to get their clients the best possible contracts. They persisted in influencing player oriented contracts which represented the lucrative multi-year arrangement. Presently, SSI has offices in Florida, Michigan, New York, and L.A.